"The Minister for Social Development, David Benson-Pope, has been contradicted yet again," Lindsay Mitchell, welfare commentator said today. "Unfortunately, this time, by his own Ministry." "Earlier this week the Minister told the public, 'The government is well on its way to achieving the goal with the Mayors' Task Force for Jobs. That is, to have all 15-19 year-olds in work, education, training or other activities that will contribute to their economic independence and well-being by the end of this year.' "
"I questioned this statement because while the Minister was saying only 1,424 youth are now on the unemployment benefit, Statistics New Zealand claim 27,800 15-19 year-olds are unemployed." "Today his Ministry has published its Statement of Intent 2007/2008, which shows that the estimated percentage of 15-19 year-olds not in formal education, training, work or looking after children is 6.6% - around 20,000 - and the trend is described as 'steady'." "The Ministry did not describe the trend as 'decreasing' putting them at odds with their Minister. It would appear that the Ministry is dealing with facts but the Minister, fiction. Pretending 20,000 youths going nowhere don't exist helps nobody." Update; I send my statements to all MPs. In response to this, one MP said he would ask some questions, another asked to be removed from my distribution list. That is the first time I've had that request. (Both MPs were both from the main parties). Social Security and welfare spending is projected to increase by 25% by 2011. This is the biggest increase across the various spending areas. Closest is Health at 22%. 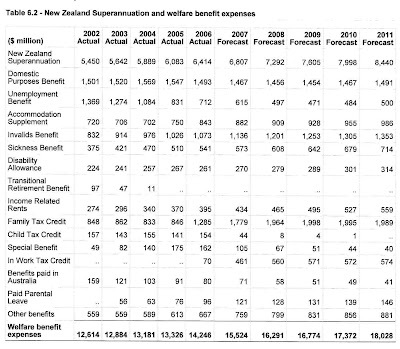 Super makes up 54 percent of the increase. The people may be sick and ailing but the welfare state is alive and kicking. I now have some official statistics from Sweden relating to children in state care. Unfortunately they only arrived this morning. Remember this is the country that has been held up as a child mecca since it banned corporal punishment in the home in 1979. 24-hour measures include care outside the home, immediate custody or a placement in the home of a designated caregiver, similar to a care and protection placement in NZ. Around 73 percent were in foster care. Non-institutional measures - On November 1st 2005 around 28,500 children and young people were subjects of one or more of the reported non-institutional measures. This group is similar to those in NZ who receive care and protection social work services but are not in placements. Compared to the first group CYF had 4,853 distinct clients in care and protection placements as at 30 June 2005. 80 percent were in foster care. Compared to the second group CYF were providing care and protection social work services to 14,335 distinct clients. Sweden has around 2.2 million 0-19 years-old. NZ has 1.17 million. Sweden had 11,148 child and young people in foster care. NZ had 3,898. In 2005 Sweden had 6.69 children and young people per 1,000 receiving 24-hour measures. NZ had 4.2 per 1,000 in care and protection placements. Based on these figures we can expect more state intervention. And will the increased state intervention reduce child deaths from maltreatment? Here is a 2005 excerpt from the British Journal of Social Work. The available evidence suggests that Sweden has a low, though not uniquely low, incidence of child maltreatment deaths. Widely cited statistics suggesting that Sweden is in an entirely different league from other countries are, however, seriously misleading. Nor does the evidence really allow us to conclude that Sweden’s relative success in this area is attributable to the ban on corporal punishment. Other countries without a corporal punishment ban also have low or lower child maltreatment death rates; the figures that are commonly cited in any case pre-date Sweden’s corporal punishment ban and there are a number of other important variables, other than a ban on corporal punishment, that could account for international variations. This is the last post I will do on the subject. The debate has been a glaring example of propaganda and misinformation and outright lies. And the majority of parliament bought it. Our prospects of climbing up the ladder (OECD) in the next few years aren't good. Recent economic growth has been fuelled by more employment, more debt, and working longer hours. There aren't more people to bring into work, so there's no more growth from that source. That must be National's welfare policy. Ignore the 266,000 working-age people on benefits. How would you feel if you were a beneficiary who wants to work? Written off? Perhaps if you were one that didn't want to work you might feel relieved. Over a third of the people on the DPB have children aged 5 and over yet have no connection to the workforce. One in ten working age people has no job and no source of income other than a benefit and we are told there are "no more people to bring into work." Treasury will be scratching their heads. They have explicitly recommended increasing the labour force participation of young women to increase GDP because there is potential in that group that better performing countries have realised. Clark supported that idea. Labour is still pursuing a policy of work first. That is to discourage applicants from entering the benefit system in the first place. OK. They haven't done a very good job with some benefits but they at least claim to believe that work is the best way out of poverty. Labour could not agree with his statement and neither can I.
I accept there are some people who aren't ever going to be self-supporting. As long as we are only carrying those genuine cases I can live with a state safety net. But that group is a small minority. This is either a damning admission or careless error from English. Let's hope it's the second. The Act MPs come from a libertarian tradition and believe that the bill not only criminalises parents who smack but that it is an example of state interference in people's lives. Thanks to National's compromise (that's right, the party that purports to believe in 'personal freedom') today power will be transferred from judges and juries (the people) to the police and CYF (the state). This isn't the trifling matter some think. God knows we need to do something about a small group of people who are not fit to be parents but that doesn't mean we have to submit to the state a massive degree of control over good and functioning families. There is absolutely no need to go this far. And another thing John Key. You have opened the door to much, much more. Having succeeded with this folly the likes of the Children's Commissioner, Barnardos, Bradford et al will move to pushing for compulsory school checks. Then they won't need to wait for a report on a child - they can make their own. They will run the same stunts they used this time. Distorting figures, whipping up hysteria over what is, again, a problem being generated by a very small percentage of families. You say you have saved the people from being "hung out to dry". No you haven't. You have just rolled over in the first of many battles the state will wage against innocent families. The War on Poverty, the War on Drugs - now the War on Child Abuse. More harm than good will come of it. Considerably more. Minister of Social Development, David Benson-Pope, today claimed youth unemployment had dropped 92 percent under Labour with only 1,424 18 and 19 year-olds on an Unemployment Benefit at the end of April. But something isn't stacking up, according to welfare commentator Lindsay Mitchell. "Another government department, Statistics New Zealand, says that at the end of March 2007 there were 27,800 15-19 year-olds unemployed. That was a 15 percent increase from March 2006." "While it is good news that far fewer people are receiving the unemployment benefit perhaps the Minister can explain how the 27,800 being reported by his colleagues at Statistics New Zealand are supporting themselves. How many 15-19 year-olds are on benefits other than the Unemployment Benefit?" Oh Golly. What fun. Families Day. Today. When government gifted us with the Families Commission I confess, I was a little skeptical about whether they would achieve anything. But I was wrong. Look. They are celebrating Families Day and just to prove how sincere they are they're letting their staff go home early to enjoy their families. Plus they give lots of helpful advice on how you too can better enjoy your family. Oh thank you. Government is good, is it not? Oooh. Oooh. I've got an idea to share too. Tell your boss Nanny says you too should have half a day off, rush home, gather your family around you and switch on the wireless at 2 o'clock. You can all listen to Aunty Helen together. What joy. United Future MP, Judy Turner, has decided not to support the bill despite the amendment. This is because she says the 'discretion' provision does not apply to CYF, yet they too have statutory powers relating to children. - a perception by the Police that making such an assessment is a social work, rather than a Police task. How often are the police simply going to 'pass the buck' to an organisation with no powers of discretion? One week tomorrow I've organised a get-together at the local pub. 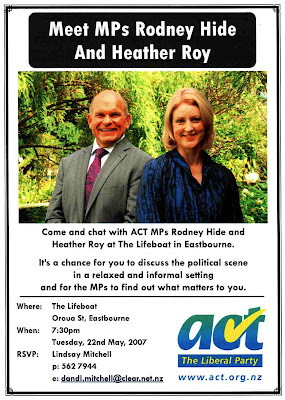 It would be great to put some faces to names and a chance for you to have a chat with Rodney and Heather. Things have come to a pretty pass when police are warning men against even talking to women but that's what is happening in Scotland. The comments are contained in a Strathclyde Police leaflet entitled 'Staying Safe'. The section entitled 'How men can help women' states: "Men can sometimes frighten women without meaning to. A woman may be nervous when she is out on her own - especially after dark or in a lonely or enclosed place, or on buses or trains." It adds: "Resist chatting to a woman who is waiting, for example, at an isolated bus stop. She won't know that you mean her no harm. Remember that a woman may also feel threatened by what you think are admiring looks." The leaflet reiterates previous advice that men who find themselves walking in the same direction as a woman should cross the street to reassure her that she is not being followed. They stop short of saying, if a man thinks a woman may be in trouble and needing help he should also give her a wide berth in case he becomes negatively implicated. Of course, that couldn't be included in a pamphlet about how to 'help' women. It is nevertheless the message men are getting. "Because how much difference is there really between an Iraqi mother carrying her baby through a Baghdad market place - just before a terrorist's car bomb goes off: and a Wanganui mum putting her toddler down to sleep on the couch - just before the gangsters guns go off?" Trotter at his blinkers-on best. There is a world of difference. The Wanganui mother has every chance to protect her child by not being involved in the gang lifestyle. She knew her boyfriend was already on remand facing firearms charges for the same type of crime that ended her child's life. Society bends over backwards to give just such a woman an opportunity to turn her back on a gang lifestyle. It is pointless to keep offering the pathway out because it just gets exploited. An Iraqi woman, on the other hand, is irrevocably trapped. I sent this to talkback last Monday. I haven't changed my mind. Children and gangs do not mix. If children were not meal tickets, there would be considerably less mixing. Gang members like to live off women on welfare, absolving themselves of any need to financially contribute to the home or family. Reforming welfare, beginning by stopping the availability of DPB to teenage parents from a specified future date, would create change. Why teenagers? Because that is generally when long-term welfare dependents, particularly Maori women, become mothers. Counter-intuitively, it's women who can make the long-term difference to the gang problem, by not having babies to criminals and potentially producing more. If society didn't pay them an income to do so, their own self-interest and survival instincts would change their behaviour.